For me, Twitter’s utility has changed a bit over the last few years. What once was used as a way for my friends and I to share what we were up to, where we were, and so on has more or less morphed into a way for me to chat with other people who share similar interests regardless of where we are. In fact, I’ve seen that each of my friends use Twitter in their own respective ways. For people that I know personally, Path – yep, I actually use it – has worked out pretty well. But I’ve met a lot of really cool, interesting, and smart people on Twitter that I interact with on a daily basis many of which I would’ve never met otherwise. @tommcfarlin how do you manage to write a blog post just about every day, but also get all your dev work and such done too? This isn’t the first time that I’ve been asked this question, and although this isn’t strictly related to development, I figure that it’s close enough to how I actually get development done that I’d share my response here. My preferred method of organizing and managing tasks is using GTD. I’ve tried a number of different ways or organizing tasks, but this particular is what works best for my how I naturally work. The thing about using GTD is that I also organize all of my personal tasks using this method, as well. This means that if I have a bill to pay, a phone call to make, or a reminder email to send, then it goes into my task list with the appropriate label. Personally, I’m a big fan of Things. I’ve tried nearly every TODO list app that’s available – I’ve always come back to it. In fact, I’m so sold out on GTD and Things that I’ve got it on both my desktop and mobile devices. There’s one caveat about GTD: I don’t use that many labels. I tend to use Personal, 8BIT, LLC, and the occasional miscellaneous label for certain things such as Envato or WP Gwinnett for groups or organizations with which I’m involved, but overall I try to keep the labels small. The reason is this: Creating labels is an exercise in not micromanaging your tasks. I’ve found that the majority of stuff that I’m responsible for falls under a very small set of groups (or labels in the case of Things). If I find myself having a hard time determine what something should be labeled, odds are it’s not a task – perhaps it belongs on my calendar, perhaps it’s something that I can manage via email (more on how I manage my inbox, later). Regardless, not everything belongs in the task list. Or maybe it will. I’ve no idea. One of the things that I dislike the most about a lot of the advice that I read online, hear in podcasts, and so on is how people recommend their process to others for getting things done. Although I’ve shared mine here, I can’t recommend this to you. We’re all different and what works for me may or may not work for you. Case in point: My wife does not follow the GTD methodology, so she naturally has no need for GTD apps. She has her own may of managing her day-to-day responsibilities. Sure, we’ve talked about it, but asking her to try my method is as fair as she asking me to try her method. I know her method won’t work because it doesn’t jive with my personality. So, with all of that said, that’s how I generally manage my time during the day-to-day. Of course, I’m interested in hearing how you guys manage your time so, if you feel inclined, then share it in the comments. Jason and I went on to chat a little longer, so if you’re interested, you can also read the entire conversation. I have tried several methods of managing my day-to-day… A notepad I carry with me, a stick note I use each day, an app on my phone, sticky notes in windows, tfs task tracking, version one, bugzilla… you get the point. The way that has worked best for me is something I read from zenhabits, 3 important things each day. I only have 3 tasks each day. If I accomplish them, then I feel success. I can easily remember 3 important tasks. What usually happens, is I do way more than that without even thinking about it. However, those 3 tasks are my goals. Sometimes, it is as simple as, Go to work, Fix a bug, Eat something. Sometimes it is, write a new framework, run a 5k, and investigate 10 plugins for WordPress. Depends on the day. :-) But the fact is, you are right, my method probably will not work for anyone else. “If I only list 3 things I will forget some important ones that I have to do.” My response to that is simply, “don’t do so much, identify your priorities”. Jason Fried, of 37signals, had a blog about a class he wanted to teach: Write an article in 5 versions: 3 page, 1 page, 3 paragraph, 1 paragraph, and 1 sentence version. I think it was brilliant, teach people how to refactor, how to simplify, and how to prioritize. Figure out how to prioritize, and everything falls into place. Yep – I’m familiar with this particular method, but you’re right in that it wouldn’t work for me :). I have to break things down into smaller tasks. My biggest problem with GTD is making sure that I don’t try to overload a given day; otherwise, I’m not able to complete all of my tasks which makes me feel as if I didn’t do as much as I should’ve. Weird, I guess. At any rate, it took my a little while to find the system that works best. For three years or so, I carried a notebook with me everywhere and used it to keep track of what needed to be done. Now I do the same thing, I just use my phone or computer. As per the conversation, I tend to make sure and get my business tasks accomplished, but sacrifice my personal stuff. I need to level up on that and make sure I get my own stuff done too. I think that bringing your personal tasks up to the level of your business-related tasks is key in getting everything done that you need to get done. 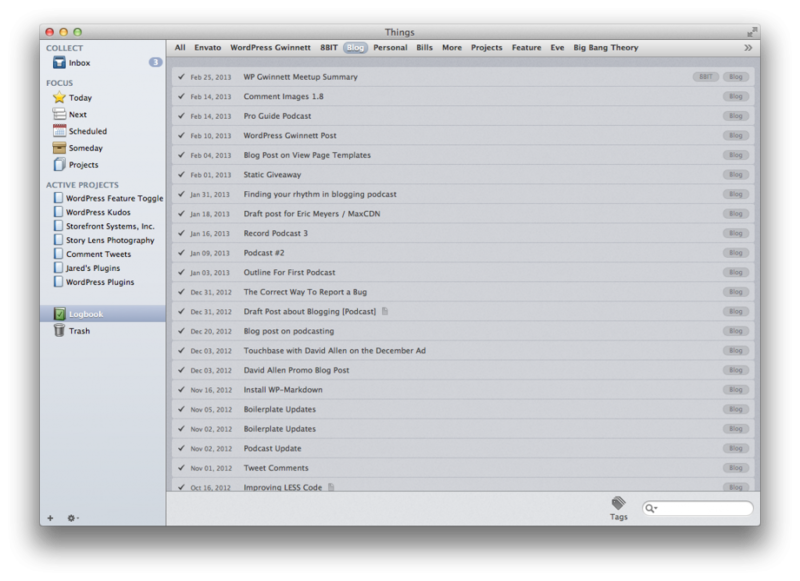 This is when I found that I was able to be most productive with GTD. Truth be told, there are times when I may have forgotten to put something into Things that I end up doing during the day, so I end up going back and adding it to Things then checking it off just to make sure that I’ve been comprehensive in capturing my tasks. It sounds weird, but if there’s something that I’m doing every month or every quarter, I can use it as a reference to see when I did it last. It’s funny that you ask about this, Kevin – this post was actually much longer and had three distinct points one of which was how I manage things like Twitter and other social networks. I ended up deleting it as I figured it was enough for a post on its own. The short answer is that I’ve got boundaries setup for when I use Twitter (for example, I don’t have the app installed on my phone), and I generally dislike intermittent distractions. I try to make sure that I can be as focused as possible on any given thing at a time.